In response to the elitism of the Founding Fathers, Andrew Jackson shaped his legacy as a political rebel and devoted representative of the common man. Today, that legacy has become a source of controversy. His advocates view him as a hero who promised to maintain democratic tradition and protect American values. But new evidence has revealed the immorality behind his policies and legal regimes. In the following excerpt from Avenging the People, historian J.M. Opal discusses these interpretations of Jackson’s presidency, and disputes the enduring image that Jackson painted of himself. Sometime after rising to international fame in 1815, Andrew Jackson lamented that his critics had him all wrong. Whether from ignorance or malice, they spread rumors and lies about his actions and motives. They also smeared his wife, Rachel, with whom he often shared his sense of persecution. 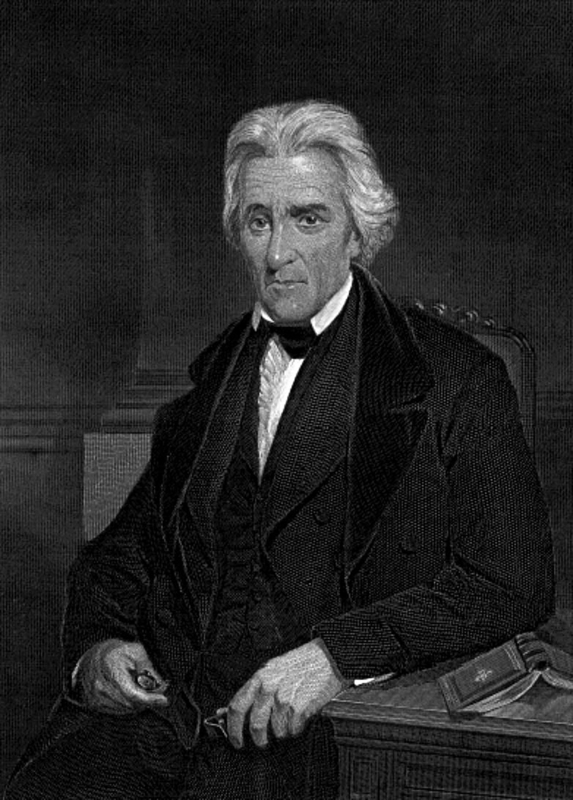 Image credit: “Portrait d’Andrew Jackson” courtesy of The General Libraries, The University of Texas at Austin. Public Domain via Wikimedia Commons. I take issue with many things that Jackson wanted people to think about him. In particular, I question his place in America’s democratic tradition, drawing attention to the popular efforts and egalitarian ideas that he and his allies helped to bury. I try to avoid the strong pull of his personal legend and the historical narratives that bear his name, often moving him off the center of analysis to better see the people, places, conflicts, and choices that made him. I do not doubt the sincerity of Jackson’s belief in his own lawfulness, nor even the accuracy of that belief. He really did believe in the law. He certainly wanted justice. And his efforts to inflict his versions of both defined his life and career in ways that his other roles and identities— an Irishman, a southerner, a westerner, a soldier, a slave owner, a Democrat— cannot explain. His life was a mission, the mission was just, and its enemies would be judged. Jackson was sure that his duties were authorized at the highest levels, and for good reason. His views on civil order and property rights often aligned with those of America’s first national leaders, who were also keen to draw the new republic into a larger society of “civilized” states. In this sense he was a proper nationalist. On the other hand, Jackson took an oath to a European monarch, was implicated in two secessionist plots, accused the federal government of suicidal cowardice, and threatened to incinerate a US government building and official. He chafed at the national terms of the rule of law and had little use for competing forms of American fellowship and sovereignty. A long series of regional traumas and global crises made him a particular kind of hero in 1814–15 and again in 1818–19, a larger-than-life “avenger” with a passionate bond to the American “nation.” His very name evoked a set of feelings and stories that marked Americans in some essential way— in their very blood, as the saying quite appropriately goes. When America set about claiming its independence, Americans had little choice but to think critically about the rule of law and its relation to natural rights. The king and his minions were waging a “most cruel and unjust war,” the first constitutions of Vermont and Pennsylvania declared. They were pursuing the good people with “unabated vengeance.” South Carolina’s new charter accused the British of conduct that would “disgrace even savage nations,” while New Jersey’s deplored a “cruel and unnatural” hostility that left the people exposed to “the fury of a cruel and relentless enemy.” The king had not just withdrawn his protection, North Carolina reported, but had also declared open season on American persons and property, risking “anarchy and confusion.” Seeking allies in Europe, Benjamin Franklin stunned his British counterparts by accusing the empire of “Barbarities” once associated with frontier scalp hunters. Stories of imperial savagery lent narrative form and moral purpose to eight years of war, during which some 40% of the free male population over 16 served in either a Patriot militia or the Continental Army. The larger theme of existential peril reappeared for the next 50 years, framing the life of Andrew Jackson, among many others, and shaping almost everything they said about virtue and republics, society and sovereignty, nation and allegiance. Unsure if the British Empire would let them live, they wondered if the rule of law would ever replace the state of nature. Unsure if the law of nations constrained any of the “civilized nations,” especially after the French and Haitian Revolutions set the world aflame, they argued over how and if they should respect the same standard. In so doing, they also debated how and if they were a “nation,” as well as a republic or union. When and where was vengeance just and lawful, and when and where was it cruel and criminal? Who had the right to take it on behalf of the reinvented people? For Jackson they evoked memories so awful that the usual terms of law and politics did not apply, demanding new bonds of holy wrath and redeeming blood. His arguments thrilled many Americans and disgusted others. Jackson’s beliefs were often more vehement than popular, and though he never hid them he also learned how to change the conversation. 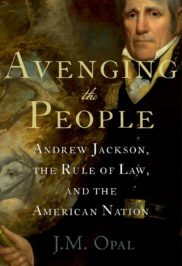 Ultimately, the sort of nationhood Jackson came to embody left Americans with a diminished sense of the law and their right to make it, indeed with less power, to be the nation they wanted to be. Featured image credit: “The Brave Boy of the Waxhaws” by Currier & Ives, circa 1876. Public Domain via Wikimedia Commons.